"Kana" is the generic term of the hiragana script and the katakana script. Usually the hiragana script is used for ordinary writing and the katakana script is used for loanwords or to lend emphasis to a specific word. *1 Vowels /u/ and /uː/ tend to be pronounced as weakly rounded or compressed close back vowels in Eastern Japan. For more details, see a Notes section in "How to pronounce romanised Japanese words". *2 This was [ɸ-] until the mid-17th century. This phoneme is believed to have been [p-] in old Japanese. *3 The actual pronunciation of this phoneme varies with the individual from [ɾ-] to [r-] and in an extreme case even to [l-]. Using [l] for this phoneme is regarded as "舌足らず (shita-tarazu; childish pronunciation, a kind of lisp)". *4 As an exception, は/ハ of a particle is pronounced as [wa]. *5 Originally [ti] but changed into [tʃi] in early 16th century. *6 Originally [tu] but changed into [tsu] in early 16th century. *7 This was [ʃe] until the mid or late-18th century. This old sound still remains in some dialects. *8 Not a typo. Hiragana /he/ and katakana /he/ are in fact similar to each other. *9 Originally [wo], but today pronounced as [o]. Despite of the same pronunciatoin as お/オ, this character is being kept in use only for representing a particle that marks "The preceding noun is the direct object in a sentence." *10 Pronouncing as [ŋ-] in the middle of a word is considered as a model. *11 In most dialects, distinction between じ/ジ [ʒi] and ぢ/ヂ [dʒi] has been lost. *12 In most dialects, distinction between ず/ズ [zu] and づ/ヅ [dzu] has been lost. *13 Originally [di] but changed into [dʒi] in early 16th century. *14 Originally [du] but changed into [dzu] in early 16th century. *15 This was [ʒe](or [ʒe]~[dʒe]) until the mid or late-18th century. These old sounds still remain in some dialects. These letters are pronounced as the syllabic nasal consonant [ɴ] in principle, but the actual sound tends to vary according to its position and the following sound; it may be [m], [n], [ɲ], [ŋ], ...etc. "あに" is two morae (/a/ + /ni/) and means "elder brother". "しった [ʃitːa] (shitta)" is three morae and means "knew, have known". As above, the phoneme represented by small っ/ッ has one mora. Small っ/ッ are never used to indicate geminating of a nasal consonant. In such cases, ん/ン is used instead: For example, ランナー [rannaː] (runner), ハンマー [hammaː] (hammer). These characters are often used to represent a glottal stop [ʔ] or emphasis in informal writing, such as "あっ (Ah!)". "トン [ton]" is a loanword from English "ton". "ー" is rotated by 90 degrees clockwise in vertical text. These characters are no longer taught in schools or used in daily life as a result of spelling reforms done in the mid-20th century. These were used to represent [wi] until phoneme /wi/ was merged into /i/. Even after that, these kana characters had been being used to indicate that "This syllable was originally /wi/" up to the reforms. These were used to represent [we] until phoneme /we/ was merged into /je/ (now /e/). Even after that, these kana characters had been being used to indicate that "This syllable was originally /we/" up to the reforms. This hiragana letter is for indicating that "This syllable was originally [je]". This katakana letter is for indicating that "This syllable has been being [e] from before /e/ and /je/ merged". Phoneme /ŋ/ that appears instead of /ɡ/ in the middle of a word (that is, complementary distribution) is sometimes represented by the K-column kana with ゜ (The handakuten diacritic). 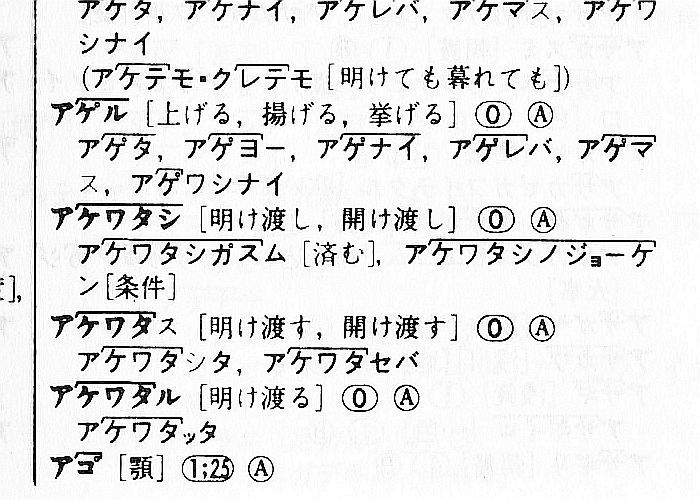 These forms are usually found in Japanese tone (pitch accent) dictionaries. The sequence of ウ + ゛(The dakuten diacritic) is used to represent Western sound [v]~[β]. However, typical Japanese speakers cannot distinguish between the voiced plosives and the voiced fricatives. So, ヴ in fact is pronounced as the same as ブ in most cases. Related to ヴ, the combination of W-column kana letters with ゛ was introduced in the late 19th century to early 20th century, such as ヷ, ヸ, ヹ and ヺ to represent [va], [vi], [ve] and [vo] respectively. However they were not well established and another way (use of digraphs) became more popular instead. The combination of R-column kana letters with ゜ (ラ゚, リ゚, ル゚, レ゚ and ロ゚) was introduced to represent [la], [li]~[ʎi], [lu], [le] and [lo] respetively in the early 20th century but did not become popular. 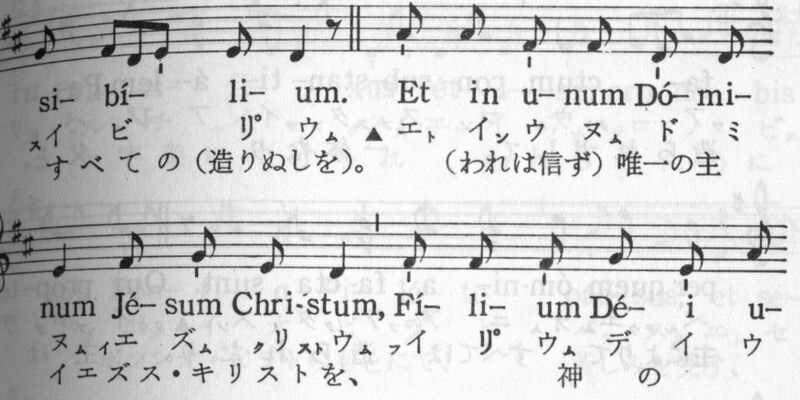 However, unlike the previous ones for /v-/ sounds, these are still used in a hymnbook. See the Church Latin kana section. In principle, the kana digraph is represented by the sequence of one ordinary kana and one small ぁ/ァ, ぃ/ィ, ぅ/ゥ, ぇ/ェ, ぉ/ォ, ゃ/ャ, ゅ/ュ, or ょ/ョ. A kana digraph represents the sound of the consonant of the first kana in normal size followed by the entire sound of the second kana in small size, such as "きゃ [kja] (き [ki] + や [ja])", "フォ [ɸo] (フ [ɸu] + オ [o])". They are represented by an I-row kana (き/キ, し/シ, etc.) followed by a small ゃ/ャ, ゅ/ュ, ェ, or ょ/ョ. *1 Mainly for foreign words. Even in that case, others than シェ, ジェ, チェ, ニェ are seldom used. *2 As well as the case of じ/ジ and ぢ/ヂ, most Japanese speakers cannot distinguish these two columns. The Japanese language had the phonemes /kwa/ and /gwa/ until the 18~19 century. They were then merged into /ka/ and /ga/ in most areas, however some dialects still keep these phonemes separated from /ka/ and /ga/. They are represented by く/ク or ぐ/グ followed by a small ゎ/ヮ. That is, "くゎ/クヮ" for [kwa], and "ぐゎ/グヮ" for [gwa]. *3 Usually pronounced as [ɸV] where V is a vowel. *4 Intended for [vV]~[βV] where V is a vowel, but usually pronounced as [bV] because most of Japanese speakers cannot distinguish between phoneme [b] and phoneme [v] or [β]. Only for /kw-/ and /gw-/, sometimes the digraphs of ク/グ followed by a small ァ, ィ, ェ, or ォ are used: E.g. クィーン (queen), グァム (Guam), クォーター (quarter). But their pronunciations tend to be two syllables like [kuwoːtaː]~[kuoːtaː] rather than one syllable like [kwoːtaː], as if they are spelled as ク/グ followed by an ordinary ア, イ, エ, or オ, such as クオーター. U-row kana + ア/イ/エ/オ (a/i/e/o): E.g. クイーン [kuiːn] (queen), スイス [suisu] (Swiss), グアム [guamu] (Guam). Other consonant clusters, such as /st-/, /kl-/, or /pr-/, are also splitted into two or more syllables as well when transliterated into kana (The number of syllables depends on the number of consonants in the cluster, as a vowel (usually [u], but [o] for [t][d]) is inserted after every consonant being not followed by a vowel, except nasal consonants that can be represented by ん/ン). 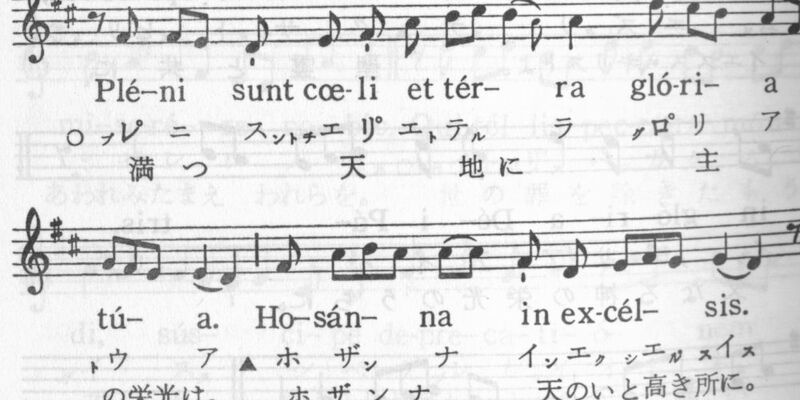 In the hymnbook used in the Catholic Church, there are some special kana characters. To represent the /l/ sound in the Latin language, the R column kana letters with ゜ (The handakuten diacritic) are used; such as ラ゚ for [la], レ゚ for [le], リ゚ for [li], ロ゚ for [lo] and ル゚ for [lu]. This usage was originally not only for the Church Latin. See also the Kana for foreign sounds (Not well known) section. *1 Probably small ン is intended for "not syllabic", whereas the ordinary ン is syllabic and has one mora. Some of old revisions of the book can be read at The National Diet Library. For eample, this is one published in 1943.